I keep coming back to the tectonic shifts in societal thinking because it keeps creeping under my skin. Here comes another post where my deep love for my fellow humans is bound to be interpreted as a judgemental rant by those who think we should be nice to even the most insidious and immoral among us. So be it. The mother responds in a way that shows she has tons more self-control than I could have had in a similar situation. She uses dark humor to point out that, regardless of the tests, she would never have aborted her son. I would not have been either as tactful or as polite in my response. "I sometimes forget that it’s not their fault. They just don’t know." Don't know what? 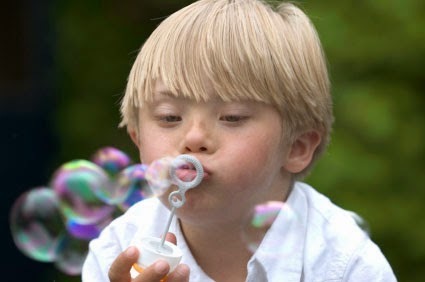 That every child, no matter his mental and physical limitations, is just as much a valid life form as another? That this child is more than his outward label as a "Down's kid" (which is really the author's central point)? What kind of a person needs to know more than the fact that this living, breathing, beautiful little boy deserves respect and that so does his mom? It is the fault of an individual if he or she chooses to utter such a cold, heartless, inconsiderate statement. This has nothing to do with a lack of "awareness." 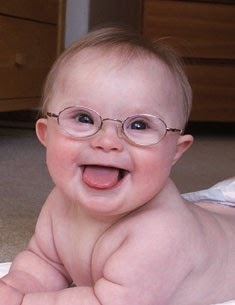 This is not about someone not understanding how lovable and wonderful a Down syndrome child can be. This cashier was perfectly aware that the little boy was different and she chose to say something that no human being has a right to say to another; something that is nothing but insensitive and that is a rude insinuation into the private life of another. The cashier should have been reported to her manager as readily as she would have been if she had cursed at a customer or thrown a racial slur at her. The cashier should be fired. She is old enough to work in a store, so she is old enough to understand basic human courtesy. Her statement was unequivocally cruel. We're not allowed to be cruel in civilized society -- or shouldn't be. What kind of a person feels the right to say something like that to a mother? I'll tell you: someone who lives in a world in which people label every transgression as the fault of the collective population. Someone who feels the right to express her thoughts comes with absolutely no conditions because the person most entitled to rights is herself. The mom who wrote this intelligent, witty and in better control, as I said, of her reactions than I would have been in the same situation. (In fact, her response was brilliantly crafted.) I commend her for that. But I just think she is too kind. Let's not keep misinterpreting the value of understanding motivations as an excuse for irresponsible actions. I cannot excuse a person for a statement like that cashier made. It is her fault and no one else's. She is a human who is supposed to filter her own statements to others. Even Jesus trashed the merchant's carts in the Temple when he had had enough. What better example of tolerance ever existed than Jesus? The man had had enough. Everything is not okay. Everything is not excusable. Forgivable, yes. Excusable, no. I enjoyed reading your post. Thank you for sharing it. You have a terrific perspective. Thank you, Sherry. Thanks for your post, as well. Your children are, if I may say, lucky to have such an intelligent, loving and articulate mom.